In which G.M. Norton bags a pair of brogues and two ties for less than five English pounds. If you have followed this periodical of mine with proper care, you will be aware that I am a regular frequenter of the great British charity shop. So when I chanced upon a bargain or three, I naturally wanted to share it with you, dear reader. Take last Sunday during a quick inspection of the local YMCA shop. This particular beneficiary boutique is fast becoming one of my favourites. It's an extremely large retail space, across one sweeping level. Largely furniture, is also comprises a good selection of books, an assortment of homeware items, and just a rail or two of clothes. 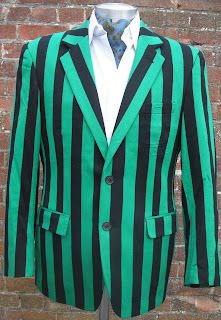 Despite the small space dedicated to clothing, over the last few months, I've picked up a couple of super blazers. One of which fits me like the proverbial glove. Indeed, when wearing it for the first time to the office, a lady caught sight of it and remarked that "It's too good for here." In which G.M. Norton tips his hat to the second wittiest man of all time. 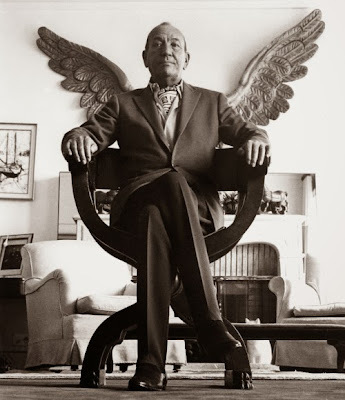 "There are probably greater painters than Noël, greater novelists than Noël, greater librettists, greater composers of music, greater singers, greater dancers, greater comedians, greater tragedians, greater stage producers, greater film directors, greater cabaret artists, greater TV stars. If there are, they are fourteen different people. 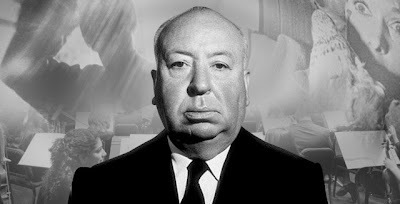 Only one man combined all fourteen different labels – The Master." In which G.M. Norton comes over all Barry Norman and waxes lyrical about one of his favourite films. When I look back at my childhood, some of my happiest memories are curling up on a rainy day, staring up at the idiot’s lantern and watching a film. 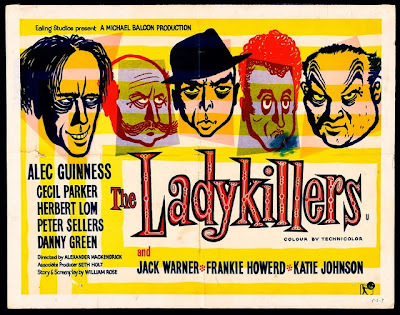 Laurel and Hardy featured quite prominently and in later years, I was introduced to the Carry Ons, Alfred Hitchcock masterpieces and James Bond. 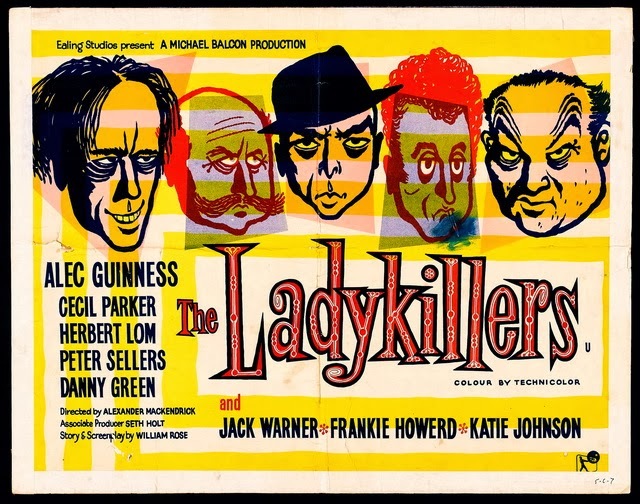 Ealing comedies were also a favourite of the Norton household, especially The Ladykillers. In which G.M. Norton visits a local tavern, but rather unexpectedly, without the intention to get utterly blotto. 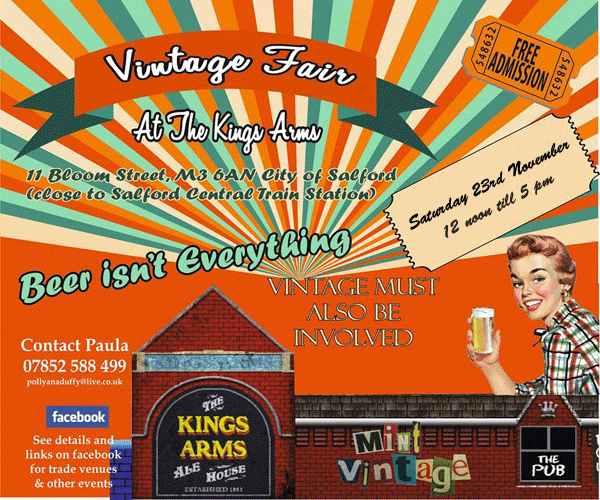 As a fellow who enjoys a refreshing libation from time to time, when I was invited to sample the delights of a vintage fair held in a local drinking tavern, I didn't need much persuading. 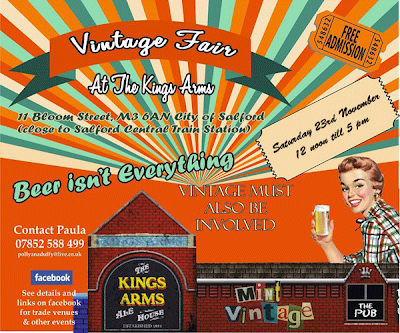 Organised by the lovely Paula Duffy off of Mint Vintage, the Kings Arms Vintage Fair is a monthly affair, which first sprung to life in May of this year. 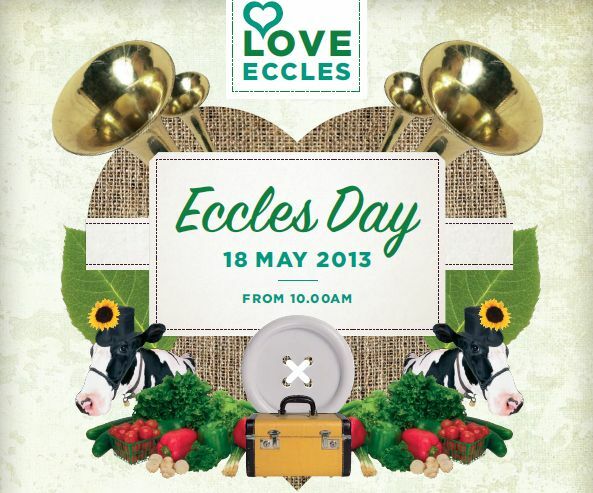 With stallholders offering a range of clothing, homeware and collectables, it is a super little way to spend a few hours. In which G.M. Norton frequents a new hair establishment and delves into the bloody history of the barber pole. 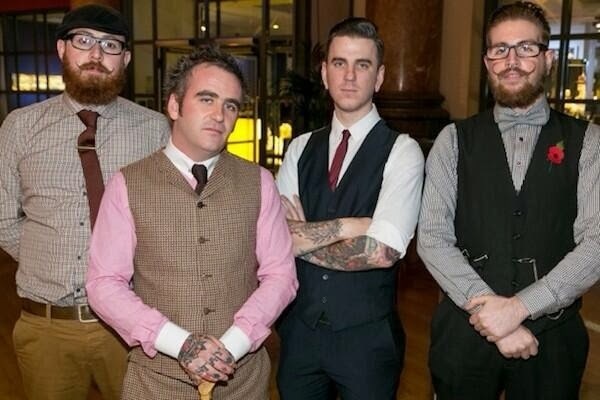 When I discovered that a new barbers was opening in Manchester specialising in rockabilly and traditional cuts and shaves, I must confess that it rather caught my attention. Barber Barber as it is called is run by Johnny Shanahan, or Johnny The BaBa as he prefers to be known. Since becoming a patron this week, the ‘BaBa House’ is now my new favourite haunt. Working alongside Johnny are three other splendid chaps, Steve, Ben and Mav. In which G.M. Norton takes ownership of a specially crafted drinking vessel. 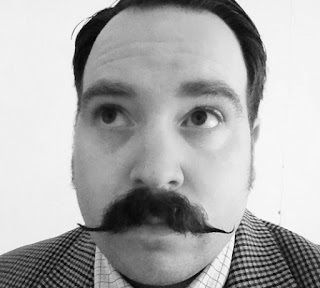 A moustache-wearing, tea drinking lefty. Now I am not hinting at my political preferences with the term ‘lefty’, I am merely proudly stating that I am left-handed, or southpaw if you are a fan of American rounders. With these three nuggets of information, it brings me on to the subject of this week’s periodical posting. 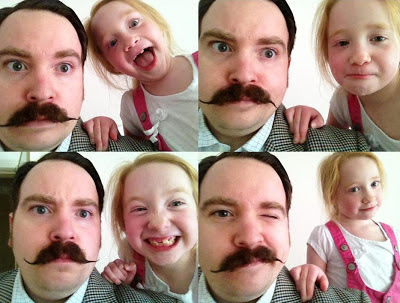 That of a recently launched company, by the name of My Moustache Cup. Eagle-eyed readers may have already spotted a little advert on this very periodical in support of this most splendid of drinking vessel manufacturers. In which G.M. Norton inducts a bearded chap into his Style Icon hall of fame. 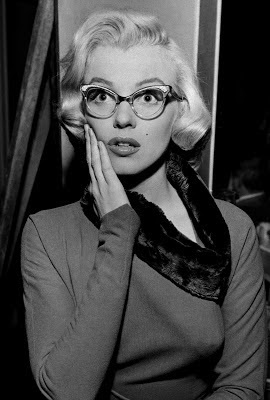 From time to time, I like to shock you, my dear thing. Not only does this entry contain facial hair of the chin, but it also celebrates a stylish man of today that is still in the prime of his life. Have I gone stark raving bonkers? No, not yet (although I think we are agreed that it is only a matter of time). 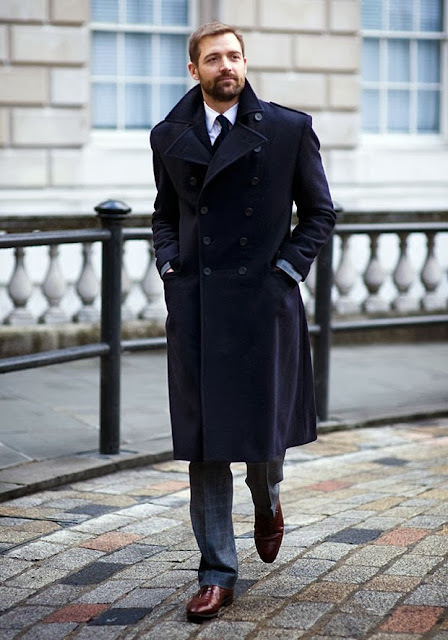 Ladies and gentlemen, I give you my latest Style Icon inductee, Mr. Patrick Grant. In which G.M. Norton shares a tale of derring-do. 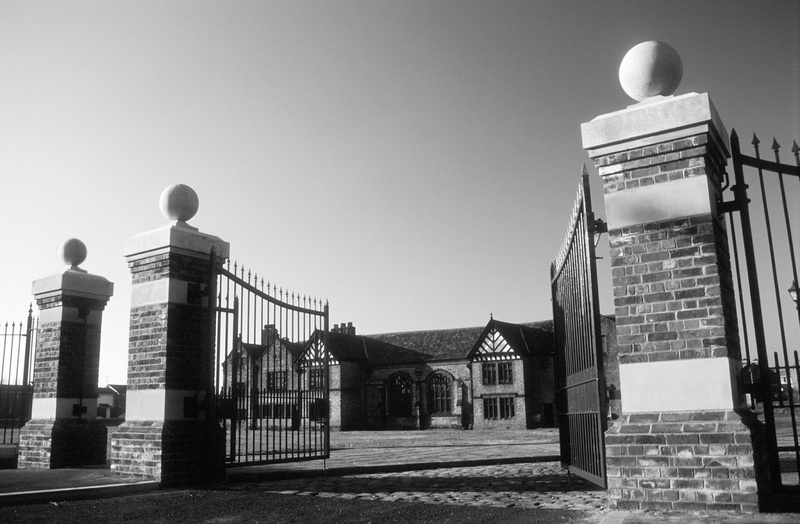 Last week I nobly agreed to accompany a group of fair maidens on a little ghost tour around a haunted Tudor manor house. Certain that mortal danger was involved, it was with some trepidation one Thursday evening that I steered my motorcar through the grand gates of Ordsall Hall in Salford. In which G.M. Norton sees his periodical crowned the best vintage blog in Manchester. Well gentle reader, I cannot lie. 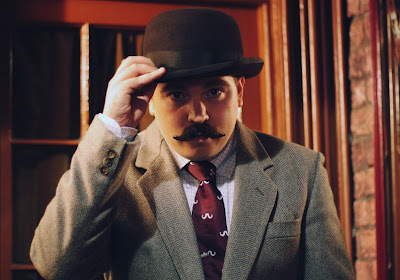 I am afraid that I need to confess behaviour that is unbefitting of a gentleman – I arrived late for the Vintage Manchester awards ceremony where I was a finalist in the Best Vintage Lifestyle Blog category. 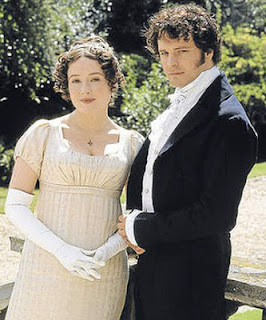 And not just by a few paltry minutes, it was by a good thirty of the things. 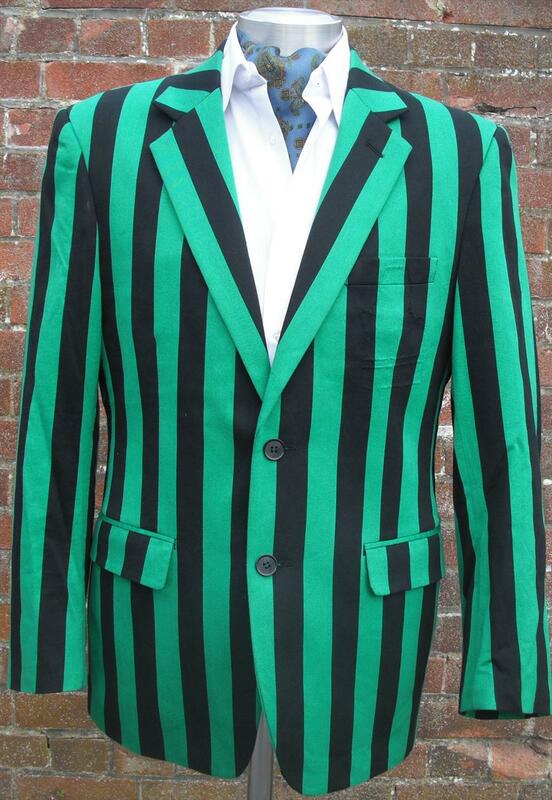 I will not bore you with the reason for my poor punctuality but needless to say, it involved a fateful wrong turn, being trapped amongst a throng of football supporters, a thirty mile dash and an unofficial world record attempt to change into full evening garb. Despite this timekeeping travesty, my beloved and I arrived at the plush Manchester 235 casino before any of the vintage shenanigans had got underway. I am not so egotistical to think that the whole event was delayed on account of my failure to turn up on time, it was more of a happy coincidence. Lord and Lady Luck must have been smiling down on your favourite protagonist it seems. 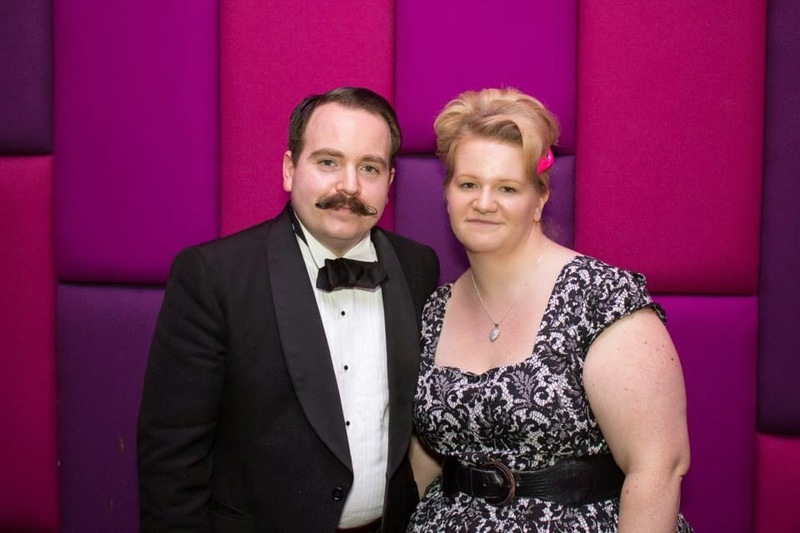 Doesn’t my beloved look ravishing with her Bethany Jane Davies-style ‘do and monochrome frock? In which G.M. 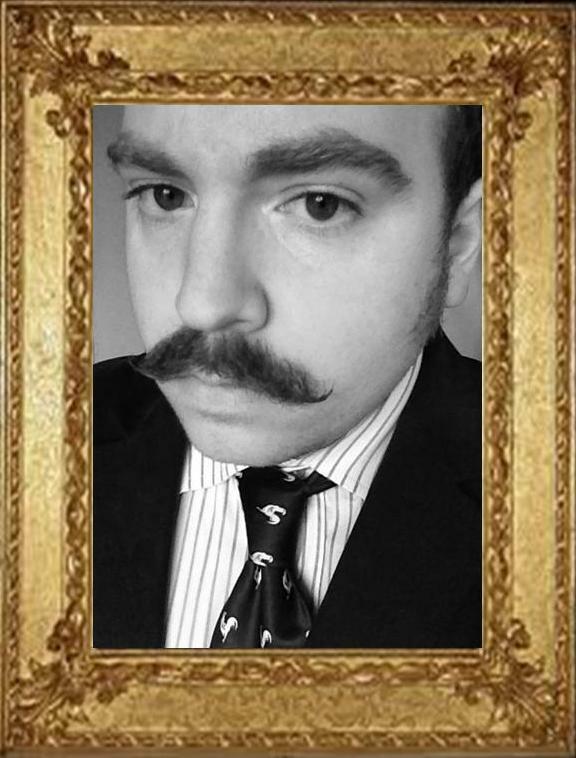 Norton offers a tantalising glimpse into the week of an aspiring English gentleman. I will place my cards on the table, dear readers. The last seven days have not been what one would call 'a typical week' for your favourite protagonist. In fact, it has been a week of surprises and new experiences in many ways. If I may be so bold, I would like to run you through each day (no need to actually exert yourself, your horrified expression at the prospect of more than a light jog has been duly noted). Ah, good old Sunday. The day when Britain collectively sits around the dinner table and devours a veritable feast of the finest roast beef in the land, mountains of roast potatoes, a few vegetables to add a dash of colour and lashings of gravy goodness. I'm sorry, is that your stomach I can hear rumbling? In which G.M. Norton portrays James Birch, the original Eccles Cake purveyor from the 18th century. Today I have not quite been myself. 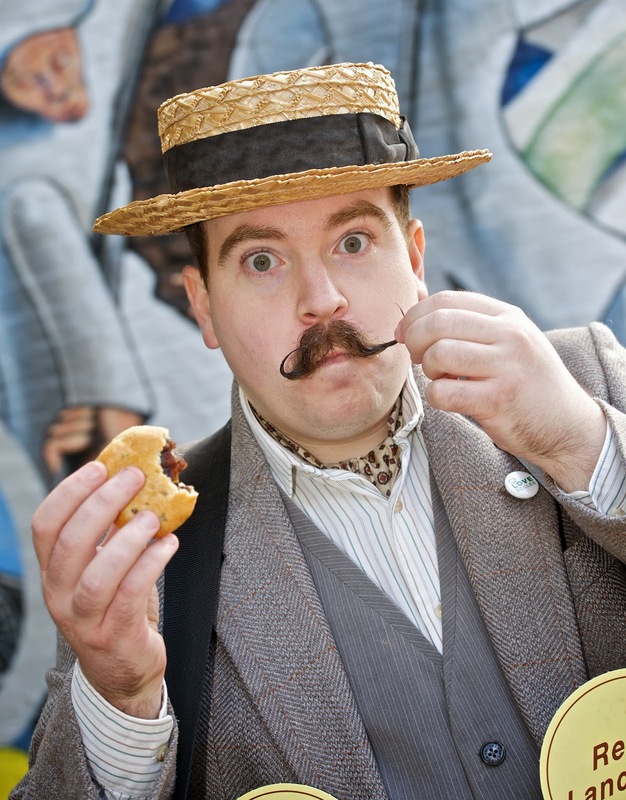 I have been Mr. James Birch instead – the person first credited with selling Eccles Cakes almost 200 years ago from his premises on the corner of Vicarage Road and Church Street. To explain my temporary change in identity, I must explain that for the past week it has been the Eccles Cake Festival. In which G.M. Norton comes to the rescue for gentlemen everywhere. The autumn and winter months are a walk in the park for gentlemen, but the summer months can be a terribly testing time. Where a gentleman was once able to cling to the comforting fabrics of tweed and corduroy, rather unhelpfully, more tropical weather doesn't lend itself to such attire. Breathe a sigh of relief though, chumrades, because as ever, help is at hand in the form of your favourite protagonist. To take the stress out of summer, I have rather helpfully compiled my top ten tips to guide a chap through the warmer climate. In which G.M. 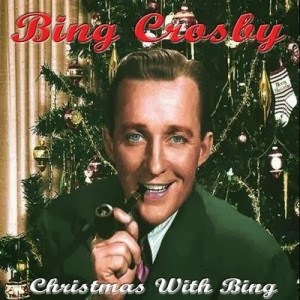 Norton celebrates the greatest British bounder in showbiz history. 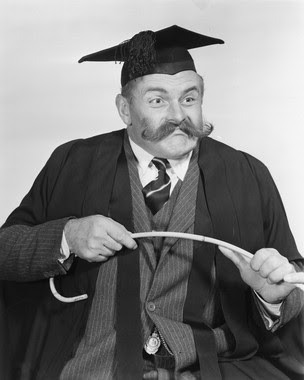 Yes avid readers, it’s once again time for Norton of Morton to accurately examine the life, times and non-sartorial crimes of a particular gentleman. 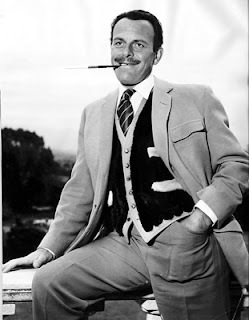 As I may have given away slightly in the headline, the subject in question is none other than the late comic actor Terry-Thomas (by a strange coincidence, Terry-Thomas is also a subject taught at the Phileas Fogg School for Amateur Balloonists). In which G.M. Norton is challenged to assemble Eccles-bought gentlemanly attire for the paltry sum of £15. 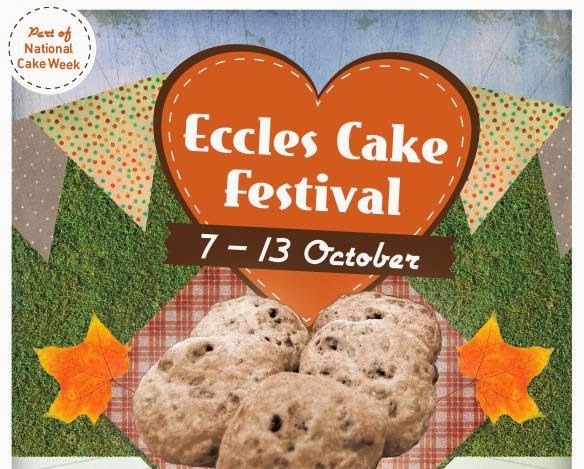 I was recently asked to take part in a Style Challenge for the inaugural Eccles Day event, to encourage people to visit the Salford town made famous for its Eccles cake. The challenge was simple – to put together an outfit bought from the town centre for a meagre £15 and then parade it during a fashion show segment on the day. In which G.M. Norton discusses home furnishings. After years of lining the pockets of various landlords, in three week’s time, I will officially become a homeowner. Naturally, I am growing increasingly impatient to move in and make our new house a home. With this in mind, my thoughts have drifted to how I’d like my new family residence to be dressed (it certainly beats filling boxes with endless pile after endless pile of possessions). In which G.M. Norton hails his new shaving brush. A few weeks ago, I had the dubious honour of turning 31. As people who know me will grumble in agreement, I prefer not to have much fanfare on my birthday. All I ask is that things are kept simple and relatively low-key. Perhaps a medley from a barbershop quartet or a burlesque dancer jumping out of a giant birthday cake. With each passing year, I am starting to hear this question on a more regular basis - “What do I get the man who has everything?” So far that reason, as well as receiving a large supply of cake and a couple of gifts, I found myself in the rare situation of having some money to spend. So what did I do? I bought a shaving brush of course. In which G.M. Norton unveils his ever expanding shoe collection. Some people collect stamps, others collect die-cast toy model cars. Lately, your favourite protagonist has being collecting shoes. Not on purpose, you understand. In fact, one could argue that my collection has been amassed quite by accident. Or certainly by circumstance. In which G.M. Norton waves the flag of St. George. 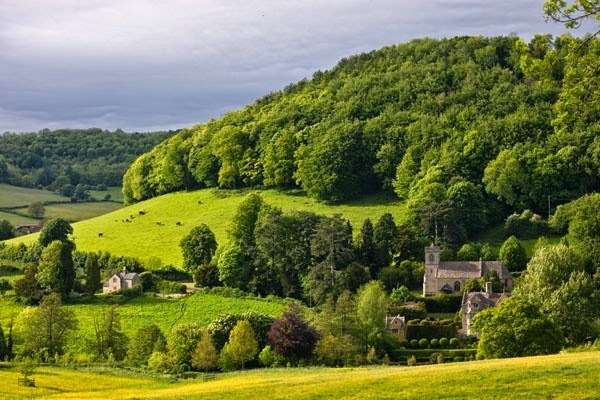 The 23rd April marks St. George’s Day, when England collectively Morris dances, feasts on the finest roast beef our local butchers can muster and Afternoon Tea becomes an all-day affair. As I write this, I am stood in a queue, draped in a flag of St. George, eating fish and chips, with a cup of tea, outside in the rain. Shortly, the sun will put his hat on and I will enjoy a brisk game of croquet. With my hair slightly mussed after my sporty escapade, I will sip fragrant, amber Earl Grey tea in a delicate, china cup and tuck into cucumber sandwiches. These will quickly be followed by freshly-baked scones, covered in clotted cream and a big dollop of jam. In which G.M. 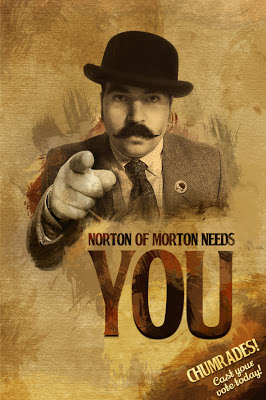 Norton celebrates the great British barber. 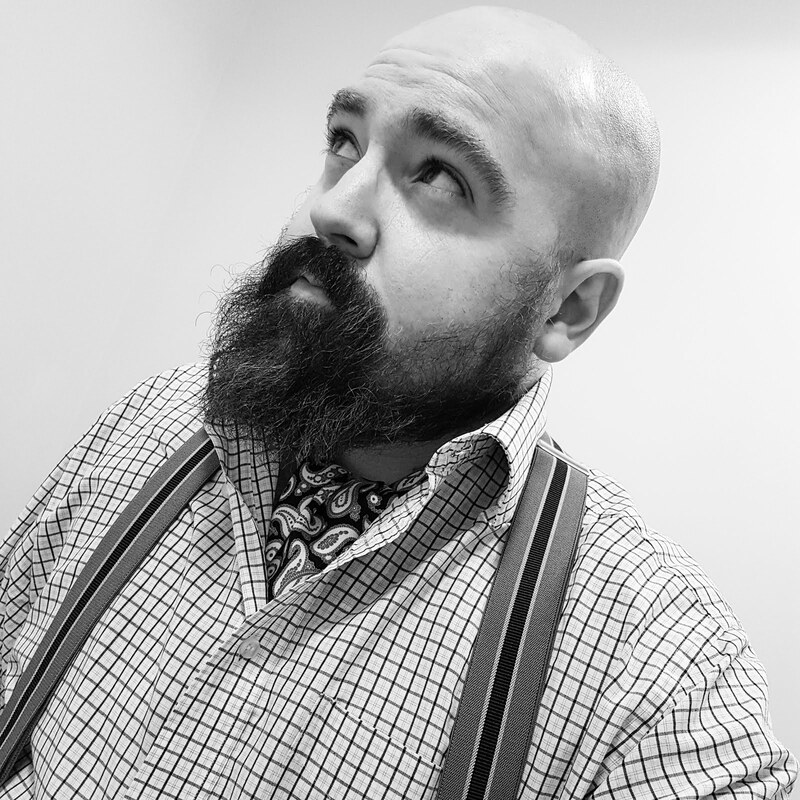 In need of a trim, last week I had the pleasure of frequenting my favourite hair establishment - Stans Barbers in Prestwich, Greater Manchester. Stans Barbers is a traditional barbershop with two scissor wielding chaps, Jack and Essa, working their way through wave after wave of men in need of a haircut and perhaps somewhere to escape. I have been patron to a number of hair enterprises over the years, including a handful of those whimsical and stupidly trendy ‘hair salons’ that charge absurd prices for absurd haircuts. In which G.M. Norton marvels at Bartitsu, the gentlemanly way to deal with ruffians. Fair warning to footpads and cutpurses everywhere! 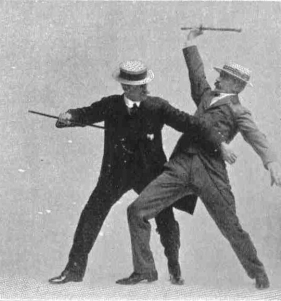 The next time you’re thinking of stealing from a parasol-carrying lady or cane-twirling gentleman, you may be the deserving victim of Bartitsu, a martial art for discerning chaps and chapettes. In which G.M. 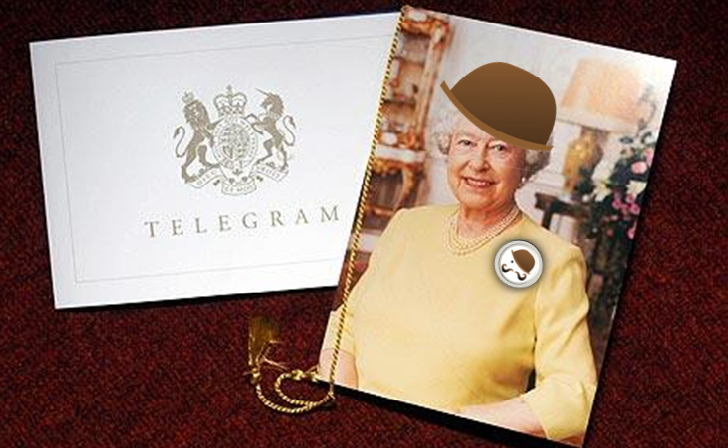 Norton ponders one of the great mysteries of our age – the sad decline of hats. The beginning of Spring is a tantalising time of the year, full of starts and stops and bitter retreats as it engages in a deadly duel with its arch enemy Winter. As we all know, eventually Spring will emerge victorious (of sorts) as light and warmth defeats darkness and cold. However, as the brave and plucky daffodils poke their heads from the recently frozen ground, we do not have to follow suit and risk cold craniums. That’s when the humble hat becomes our saviour. Not only does a hat offer protection against the elements during inclement weather but it also transforms you from dowdy to dapper. In which G.M. Norton announces his latest Style Icon inductee. Hello avid readers and welcome to the latest exciting instalment of your favourite weekly periodical, brought to you every Saturday at four o’clock. 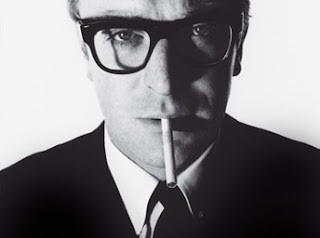 My latest posting concerns the famous thespian, Sir Michael Caine who I have sought fit to induct into my Style Icon list, joining Sir Roger Moore and Cary Grant. "My name is Maurice Micklewhite." In which G.M. Norton makes an exciting announcement. I am rather excited to reveal that my babblings have made it inside the March/April issue of Pretty Nostalgic, 'the independent vintage lifestyle magazine celebrating everything that's brilliantly British'. 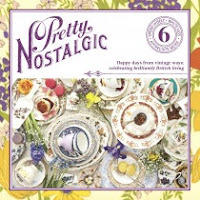 If you’ve not yet had the pleasure of perusing a copy of Pretty Nostalgic, I would hastily recommend that you toddle over to your nearest W.H. Smiths. Although it is quite pricey at £8 a copy, it is a first class publication and when you consider that it is completely independent, I think it’s worth every penny. The illustrations and photographs are a wonder to behold and worth the reading fee alone. In which G.M. 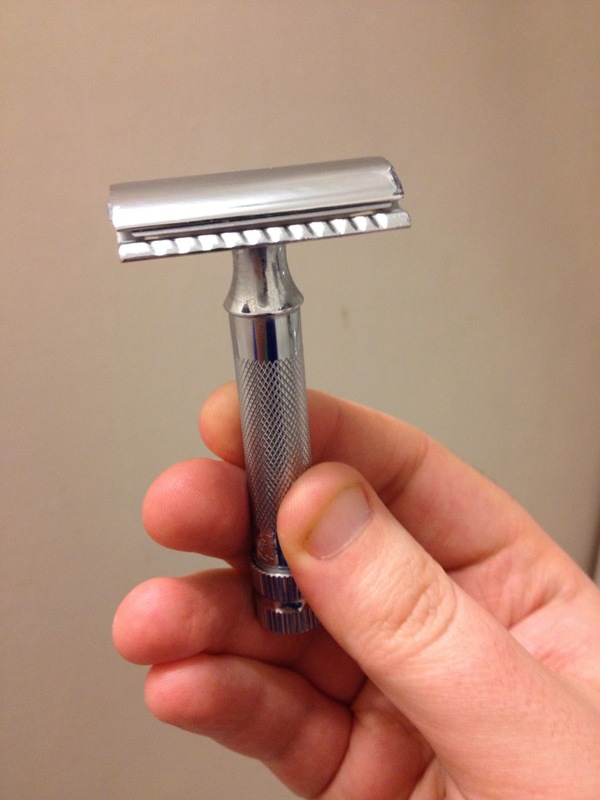 Norton cuts straight to the point and recommends his favourite safety razor. For gentlemen searching for the perfect shave, the straight (or cut-throat) razor is undoubtedly the best option available. Especially if you’re looking to introduce a touch of danger into your morning routine. However, for the vast majority of traditional wet shavers who don’t want to bother with the strops, stones and scales of straights, the double-edged safety razor is the preferred weapon of choice. In which G.M. Norton looks both ways, taps his nose and sagely informs his readership about the best hair dressing product for gentlemen. 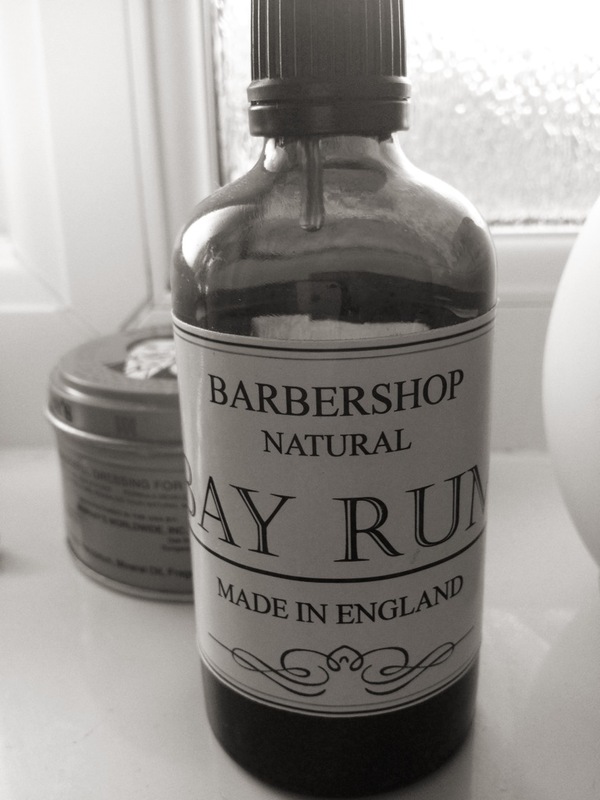 When it comes to a gentleman’s hair dressing, there is really only one option – pomade. If you’re not familiar with this particular hair product, please allow me to enlighten you. Pomade makes hair look slick and debonair, giving it a sophisticated shine. 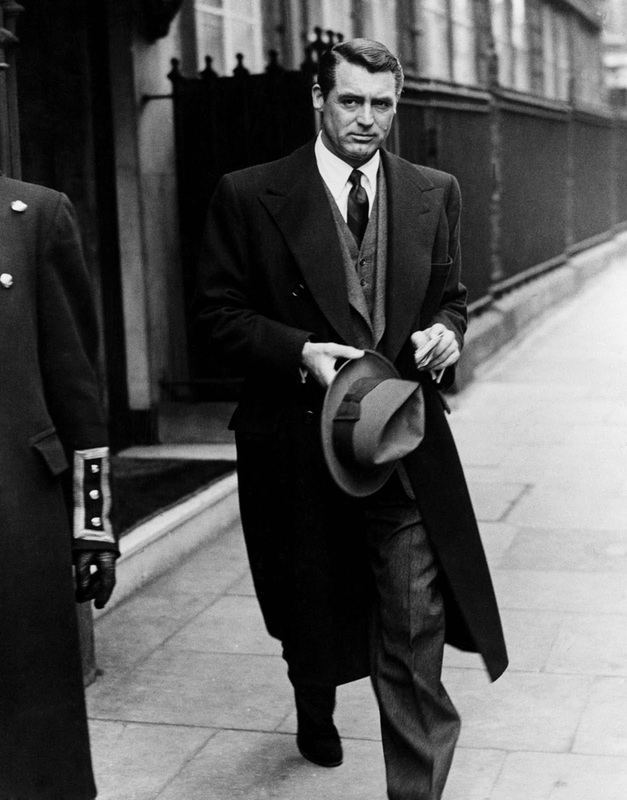 As well as being used by luminaries such as this periodical’s favourite Cary Grant, it was also widely used by teddy boys to create sweeping, gravity defying pompadours. In the 18thcentury, it was a rather exclusive product, accessible only to the gentry which is fitting given the gentrified hairstyle it helps to create. In which G.M. 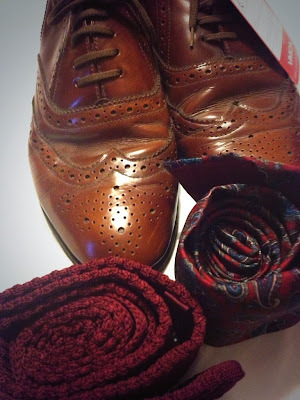 Norton explores the history of the humble handkerchief. 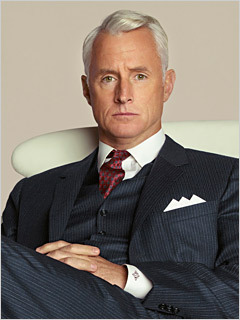 Contrary to popular opinion, Mad Men’s Roger Sterling did not invent the pocket square. 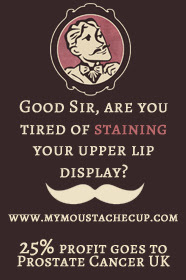 Although it is only fair to credit the inebriated advertising executive for helping men to rediscover the lost art of sporting an elegantly folded handkerchief.